I am late posting this, but my talk is up, and it is pleasant to remember winter in July! 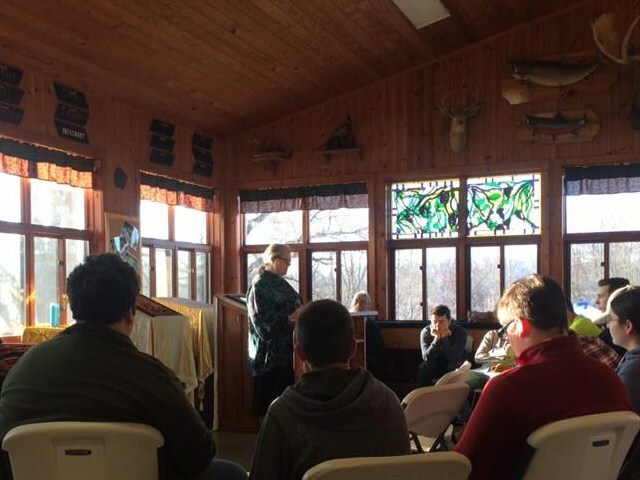 My husband and I spoke at a youth conference for Orthodox Christian teenagers and young adults, 43 of them, with seven adults. It was a very great honor. 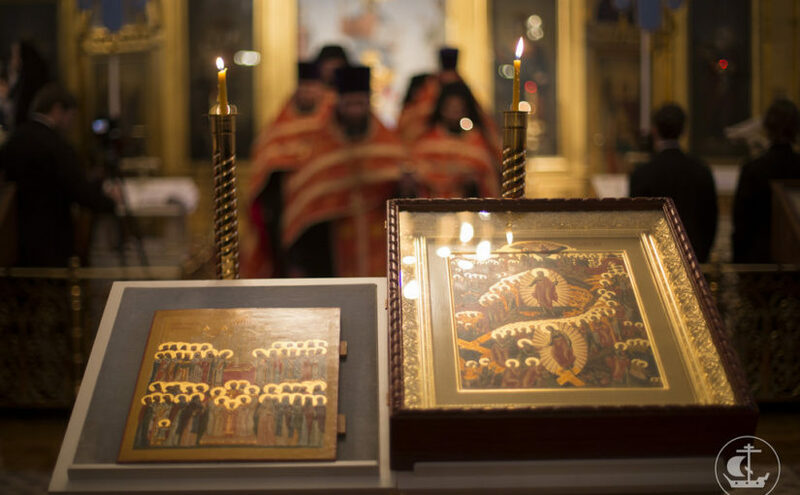 The conference was dedicated to St. Herman of Alaska, a missionary saint who came to Alaska from Russia in 1793 both to serve the Russians who lived there and to minister to the natives, many of whom became Orthodox. While the St. Herman’s Conference has been well established on the East Coast — I met my husband at one in 1980 — the midwest St. Herman’s Conference is relatively new. I spoke at the first one in 2008, when there were closer to 20 of us, and it was a joy to see how it has grown. The diocese now has a program to encourage the youth to sing in their parishes, and several of them conducted pieces for the services we sang together. Each conference has a theme. The purpose of this gathering was to bring people together to discuss friendship, the internet, and God. The kids came from everywhere — Chicago, Alaska, Oklahoma, Texas. They listened attentively, asked sharp questions, shared their lives and problems, and learned to sing the services together. They played in the snow on snow tubes and in a human Foosball game, volunteered for four hours at a homeless shelter, and got to know each other over all- you-can-eat fish tacos and bowling after. We ended the services at the St. Herman parish in Hastings, where our friend Fr. Michael Carney is rector. My talk was on how to “curate” your thoughts before sharing them on the internet. I could not have given this talk before the studying I did for my MFA in Writing. I had to learn to curate my collection of thoughts and experiences, to share them in the best light and with the right juxtapositions, before I could speak to the youth about what to share and how so we can lift each other up and support each other rather than tear people down though our online participation. The camp where the conference was held is a place of great natural beauty. The dining hall overlooked a frozen lake, and the sky above was a study in blues and greys by day, infused with orange and pink at sunrise. I had thought of Michigan winters as bleak, because I looked at the snow on the side of the road. When you stand in nature and look up, everything changes. A bishop friend says, “Private prayer is important, but it is only in the services of the Church that we find spiritual regeneration.” And online contact is important, but it is only by meeting face to face that we truly become close. The internet helped us to organize, but of incalculable value was the face to face contact we made, forging new friendships and deepening old ones. The world can be so cold, both physically and otherwise. It is essential that we make every effort to overcome it, banding together to share and to spread the warmth. It was very strange to start today with eggs, because in my youth, this was a solemn fast day. Every day is the feast of some saint, in the Russian Orthodox Church. Some days are fast days, on which we eat less and have no meat or dairy, in preparation for joyous events like Christmas and Easter, others are feast days, others are fast days because the day commemorates something sorrowful, like the beheading of St. John the Baptist. Today is the anniversary of the killing of Tsar Nicholas II of Russia and his family — the Empress Alexandra and their children, Olga, Maria, Tatiana, Anastasia, and Alexis. In the West, the deposition and murder of the Tsar is seen as a good and inevitable thing, but the exile and murder of his wife and children cannot be defended, and the results for Russia were catastrophic. The new era of equality and friendship that was supposed to be ushered in became, instead, seven decades of fratricide, genocide, misery, imprisonment — and martyrdom. Only later did I learn Russian, and learn some of the stories. These men had lost family members throughout the years since the revolution — grandparents and beloved aunts, then fathers, and brothers and sisters. My godfather’s father, the famous violinist Julius Conus, whose exercises for students were the norm across Russia, died of starvation on the streets of Moscow in 1942; he had been declared an enemy of the State, and one could be arrested for feeding him. When I was thirteen, that was only thirty-four years previous, as if it had happened in 1983 now. Our priest’s father had been locked in a barn with other engineers at the beginning of the WWII and the Communists set the barn on fire so the approaching German army could not capture that much brain power. Others had seen their relatives die rather than be repatriated during Operation Keelhaul. Many of the people who killed their loved ones were still alive, still in power, gloating. There will always be someone who mocks you for having hope and faith that things will be better. They are often wrong, and always are short-sighted. Things got better. 1981, our church glorified the New Martyrs of Russia, recognizing them as saints. In 1991, Communism was overthrown in an almost bloodless coup in Russia, and in 2007, our church reconciled with the Moscow Patriarchate, from whom we had separated ourselves until we were sure it was no longer the captive of a State hostile to its very existence, who used the Church for its own purposes. Lenigrad is back to being St. Petersburg. Churches that were turned into museums, theaters, toilets, and beer houses have been returned and restored. New churches are under construction to replace those destroyed and to hold all those who now freely pray. Miracles have happened in our lifetime. All over the world, in places that we know of and in places shaded by the darkness of oblivion, there are men, women, and children suffering because they choose to believe in God and to live the life that faith requires — praying, visiting the sick, feeding the hungry, clothing the naked, even when the sick and suffering have been declared less than human by the States in which they live. There are people in unspeakable conditions in prison, under political pressure at their jobs, forced into silence at home by hostile in-laws, silenced and punished by ideologically motivated teachers. But where there is love, there is hope, because God is love. Today this former fast day is a day for Divine Liturgy followed by festive foods, cake and ice cream and presents in the homes of those celebrating the feast of the saints for whom they are named, and we all remember that when things look their darkest, God has a plan in place for overcoming evil. If we don’t conform ourselves to evil, we may suffer in this life. But through suffering with love, we can be changed into saints.